Roasted Almond Butter Bars with Whole Grain Crispy Brown Rice & Dried Cranberries for endurance & nutrition. 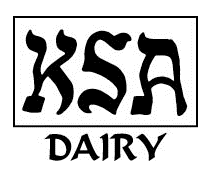 The KSA symbol is a firm guarantee to all consumers that the products bearing the symbol are in full compliance with the most demanding of kosher standards. You can be sure that your products will be marketable, enjoying the same status, recognition and acceptance, as any other reliably certified kosher product. The Non-GMO Project Product Verification Program is North America’s only third-party verification for non-GMO food and products. Third-party verification is the highest quality system when it comes to product labeling and certifications because it ensures products have been comprehensively evaluated by an independent party for compliance with a standard developed by industry experts and stakeholders. Almond Butter (dry roasted almonds), Crispy Brown Rice (whole grain brown rice flour), Brown Rice Syrup, Barley Malt Extract, Cranberries (cranberries, cane sugar, sunflower oil), Dry Roasted Almonds, Honey, Sea Salt, Soy Lecithin (emulsifier), Locust Bean Gum, Carrageenan Gum.